Drama, Drama, Drama! I love it! I don’t know how I am going to make it through this project alive; I should probably carry a stent around with all of my cables and electronics just in case. Arrived at Jane this morning and Wilfrid hadn’t, so I decided to wait in the Starbucks across the street (I’ll be doing so much of this in January, it demands an acronym). I get a text saying that he had a rough night and wouldn’t be able to make it. Panic at the disco! Not to worry, right? 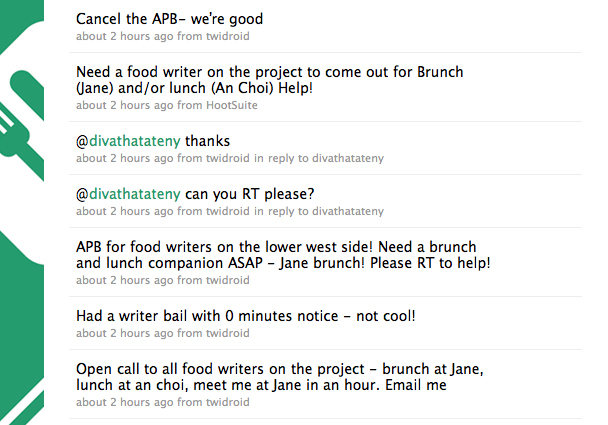 Sixty writers on the project, proposition of free food, a heavily trafficked twitter account, and all of their e-mails and phone numbers. Twitter APB – mass e-mail – sent and sent. Now I wait. 2 Minutes … 5 … 7 … Call from Wilfrid; he’s slugged an Emergen-C and cabbed it over and is seated, hangover and all. To be honest, he cleans up pretty well (or maybe he’s just very well-dressed). Nine minutes … as I’m setting my things down at the table, Dan Delaney calls me and was practically out the door on the way over. Mad props. Send out another email to cancel the APB, cancel on twitter; crisis averted, brunch underway. We were taken care of by a cute redhead and Tim Hall, the new manager of Jane coming from the sister restaurant The Smith. Tim just started reading The Last Lecture and said that my “me” page sounded similar to first few chapters of the book, so I referred him to the vipassana meditation center in hopes he might check it out. For any of you considering it, ten days of solitude is no joke. OK, let’s talk about the food. We had the Rosemary Fries, the Benedict Jane, the Benedict Johnny, and the Vanilla Bean CrÃ¨me BrÃ»lÃ©e French Toast (you know I copied and pasted crÃ¨me brÃ»lÃ©e). Quick rating: Rosemary Fries and Benedict Johnny, tie for first, French Toast, 2nd, Benedict Jane, 3rd. You know how McDonald’s fries can lose a bit of their warmth and still be all right, but Wendy’s; awesome when piping hot, but if they lose a joule they’re terrible? 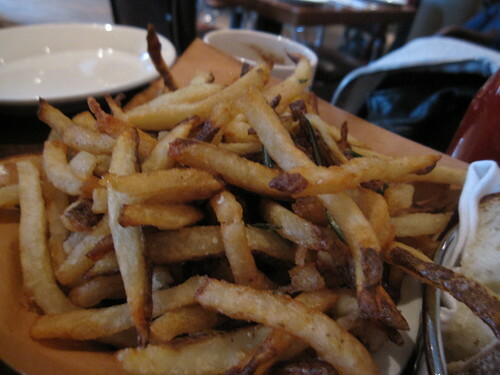 Well, the fries at Jane … they were fantastic for over half an hour. I’ll often eat every single fry before I consider touching my burger, but the Benedict Johnny (I’ll get to this guy in a second) looked so good, I ate the whole thing before I even touched the fries. They looked like they were going to be the standard, over-crisp frites you get at the wannabe French restaurants. Au contraire, mon frÃ¨re – they were gorgeous. Wilfrid, a long-time patron of The Smith, told me that they had the same fries over there and he’d had them all the time (lucky dog). The fresh rosemary was prevalent, a light garlicky tinge gave them a little more spice, and the crispness stayed (and I try to avoid using this word) perfect for the entire meal. I would say I’d be back for the fries, but I can’t dis the Benedict Johnny by not including it in my must-eat list at Jane. 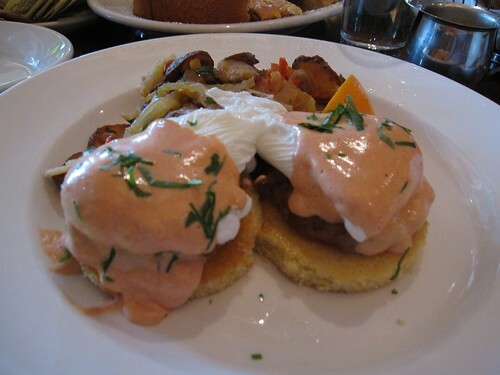 You’re not going to order Poached eggs, maple chicken sausage, corn pancakes, and roasted tomato hollandaise? Don’t be ridiculous. The key to this dish is the corn pancake (also called a Johnny Cake); the consistency, sweetness, and size marry the maple chicken sausage to a T. Make sure to ask for the spicy vinegar on the side; the tangy balances with the smoothness of the tomato hollandaise and really kicks it up a notch. The Vanilla Bean CrÃ¨me BrÃ»lÃ©e French Toast … I think the waitress said it best; “How can anything called CrÃ¨me BrÃ»lÃ©e French Toast be bad?” If I hadn’t been eating in three hours, I would have easily finished both the benedict and the entire plate of french toast. You can see it, but the bread was about an inch and a half thick, with vanilla-y goodness permeating and BrÃ»lÃ©e-y crispiness covering the whole thing. The Benedict Jane (the crab and crawfish cake benedict) is going to get the consolation prize for me here. We both agreed on the juxtaposition of flavors in the Johnny winning the day, but looking back on it, I actually can’t speak to where Wilfrid placed it on his ratings scale, whether it was in front of or second to the french toast. He might not have been a big sweets-for-breakfast kind of guy. The IRL Arts Foundation and The Wandering Foodie thank Jane for providing this meal. ohh another place with creme brulee french toast! corner cafe down in soho serves a mean creme brulee french toast too. i'll have to check janes' out though. Jane looks like an excellent brunch location. 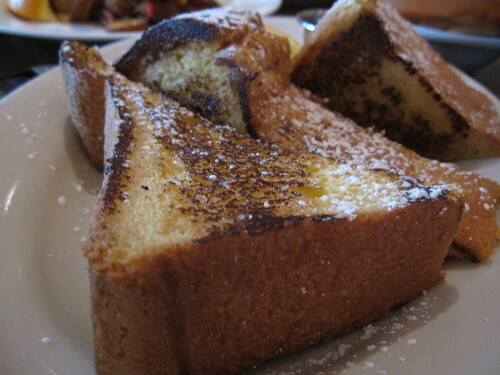 The creme brulee French toast looks amazing. Btw, if you want to abbreviate Starbucks, you might consider SBUX, as this is its stock market ticker. Psst, It's ncsuemme (as in North Carolina State University + the nickname Emme… so I guess it could also be NCSUEmme.) That Johnny Benedict looks amazing, as does, of course, the french toast.